Today I received the gift of time. My friend, Sonia Ribaux, gave me 30 minutes. Not 30 minutes of her time, rather 30 minutes of my own time. You must be wondering how it’s possible to be given a block of your own time. Read Take 30 on Sonia’s blog, Clicking 50. I still haven’t decided what I’m going to do with that extra 30 minutes. But I am touched and enjoying mulling over the possibilities. It took no time at all to twist a good sounding recipe into jittery shape. I enjoyed this dish hot or cold. I’d suggest a side of taco chips, a little brown rice and a simple green salad as accompaniment. Heat 1 tablespoon of olive oil in a pan over medium-high heat. Add onion, cumin and ground coriander, stirring for 7 minutes until the onion is translucent and browning. Add garlic and jalapeno, stirring for 5 more minutes. Add tomatoes, maple syrup and salt to taste, cooking 5 more minutes. Add black beans, and cook 5 more minutes. 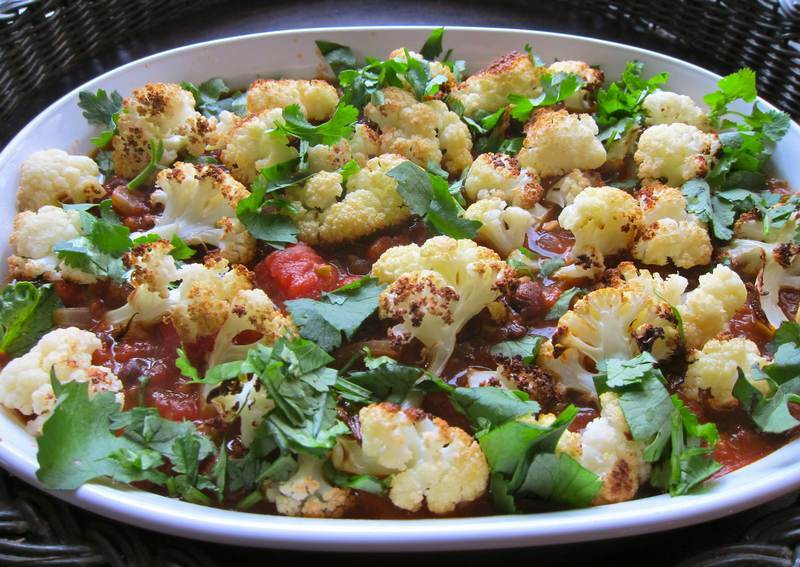 Serve the tomato bean mixture in a shallow casserole with the browned cauliflower on top. Garnish with cilantro leaves. This Cauliflower Casserole was adapted from nutritional practitioner Sabina Spiegel’s recipe in the Jewish Tribune, which featured butternut squash. Speaking of gifts, my dear friend and colleague, Susie Martin, gave me “The Sharper Your Knife, The Less You Cry” by journalist Kathleen Flinn. Susie knows how much I appreciate good recipes and good reads so she makes sure to supply me with both. I’d like to give each of you the gift of seeing your favorite recipes guest starring on Jittery Cook. Email them to me ([email protected]), and you’ll be entered in the draw for Blackcurrant Vodka — Just in time to raise a glass and say a toast this holiday season. « Carmelitas – Afternoon Delights! Thanks Donna! You made my day! Loved the wedding photos. You all look amazing! 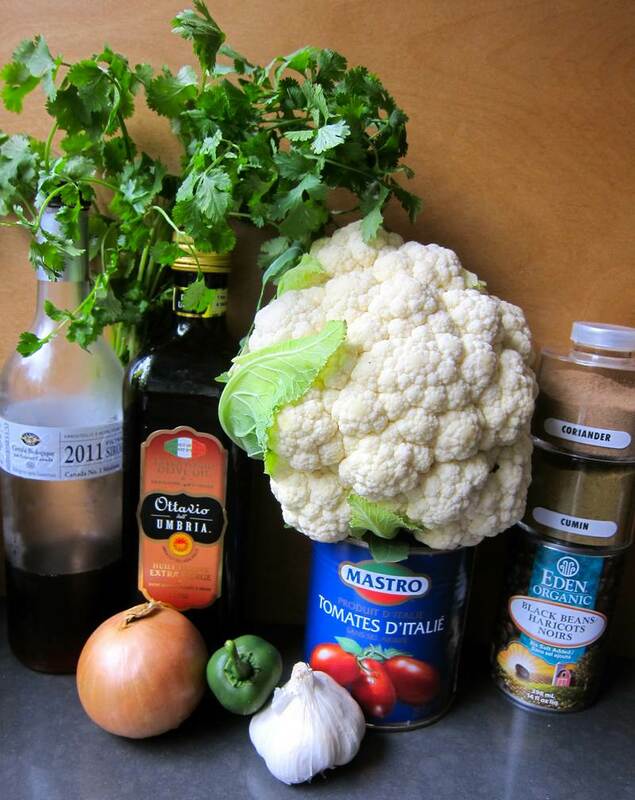 Love it, Holly, cauliflower being “the” vegetable in my culture…. Had a great time at the conference too… and took my 30 today…. thanks! A gift of your own time – so simple! Thanks for the yum! I would love to make this recipe but you don’t mention how many it serves…?? I’m thinking 6 portions. Sorry for the omission and thanks for liking!